Heating, Air Conditioning, Plumbing, Electrics, Kitchen, Bathroom and Bedroom Refurbishment, Wall and Floor replacement, External reboarding and texturing, Decking. We are a small friendly team of experienced Park Home refurbishers with 10 years experience in this field. 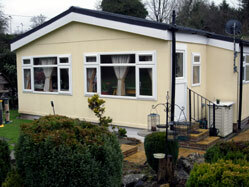 We understand that Park Home owners deserve the professional, efficient, reliable and friendly service which we offer. We have a portfolio of certification which is available for perusal and validation and also many letters of commendation from customers for whom we have worked. We are Gas Safe Registered and do not use sub-contractors. Although we are based in Poole, we are available to travel to any part of the UK and there follows a summary of works we are able to undertake. A full central heating system include regulatory HE Combination boiler, radiators with thermostatically controlled valves (as recommended by Part L legislation) and associated pipe work. Pipe work is redirected under the home, clipped and insulated to current standards. We would not advise installation of just a new boiler and not the pipe work as this may invalidate the warranty on your boiler if debris/sludge from the old pipes work their way in to the boiler. We can give you full details of this on request. Full installation normally entails the removal of the Fortic cylinder, which also gives you extra cupboard space. If your boiler is removed and you wish the “chimney breast” is removed, we will also repair floor and ceiling ready for re-decoration by you. Your system/boiler will be fully warrantied for twelve month. We will visit you at your home and show you a brochure of kitchens which are available together with prices. Once you have decided on which kitchen you would like, we will arrange for a “plan” of the kitchen to be agreed with you. Once this is agreed, a written quotation will be sent to you for your perusal and if accepted we will arrange a suitable date for the work to be undertaken. If you require a bathroom refurbishment albeit a full bathroom refit or just a new shower/bath/toilet, we will visit you at your home and supply a brochure for your perusal and show you samples of wall cladding to be installed. The cladding is especially designed for Park Homes due to the fact that the Homes “move” slightly. If tiles were to be used, in most cases within a short time the movement of the home is likely to cause the tiles to fall off. After full discussions with you, we will provide a written quotation and arrange a date for commencement of relevant works. If you decide that you wish to have an internal restructure, we are able to remove existing walls, place in whatever position you wish new walls which will be taped and jointed ready for redecoration or painting by us if you require. We install new UPVC skirting boards and also internal doors. This could be a repair (which will be left water tight), a re-paint for which we use Resitex park home recommended texture and stipple or a complete re-boarding and paint. We also install new windows, doors, porches and conservatories. Please note that with any extension to your home, you will need to have written permission from the park owner to comply with their regulations. We also also install UPVC skirting if required. We can also help with fire or water damaged floors/walls and ceilings. IMPORTANT NOTE - We will remove from site at no extra cost any materials extracted in each matter. We guarantee to quote at least 10% cheaper than any like for like written quote.